For the second week in a row, there's a deluge of new rock songs to talk about as we look back at the ARIA singles chart from this week in 1993. But among this week's grunge, metal and retro-influenced rock, we also have the top 50 debut of the closest the rock scene came to producing a pop star. Was there anyone more '90s than Lemonheads' Evan Dando? His band's big hit was a cover version, but he was also renowned for his own songwriting... and his good looks, romances, partying and drug problems. How very '90s. Also among this week's crop of new entries, a future chart-topper from another of the decade's biggest rock stars. The chart-topping single this week in 1993 was still "You Don't Treat Me No Good" by Sonia Dada, which spent a third week at number 1. Right behind, Whitney Houston wasn't going away in a hurry, with "I Will Always Love You" at number 2 also for a third week following its 10-week stretch at the top. Another single from Better Times, another peak in the 70s for The Black Sorrows. 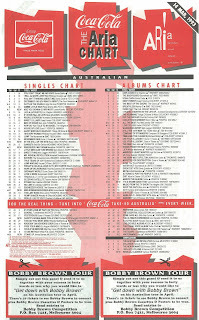 The album's fourth single, "Sweet Inspiration", did even worse, missing the top 100 completely. Never as big in Australia as their grunge contemporaries, Alice In Chains made their first top 100 appearance with this song from Singles. The film's director, Cameron Crowe, co-directed the music video. The Sydney band edged ever closer to the top 50 with this latest thrashy release from their Light Speed Collision album. For a group with as much star power as Company Of Strangers, it's kind of surprising their songs weren't bigger. Previous effort "Sweet Love" had been unlucky not to give James Reyne, Daryl Braithwaite and friends a top 20 hit, but their third single came nowhere close to achieving that, despite being another sing-along pop/rock tune like debut release "Motor City (I Get Lost)". "Daddy's Gonna Make You A Star" might not have been a bit hit, but it did help push the band's self-titled album into the top 10, where it spent one week in early April. They'd been releasing music since 1987, but it wasn't until their fifth album, It's A Shame About Ray, that things took off for Lemonheads - and top 20 chart success came thanks to their remake of Simon & Garfunkel's "Mrs Robinson" (which was tacked onto a re-release of the album). 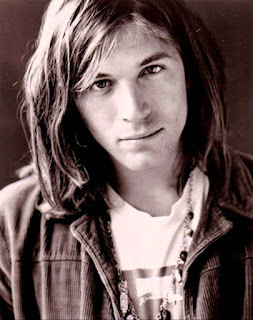 The band's rock update of the song was recorded, despite singer Evan Dando hating it, to coincide with the 25th anniversary of The Graduate, in which the original version had featured. It wasn't the first time Lemonheads had released a cover, despite Evan's original material being quite well regarded. In 1989, they'd put out a remake of Suzanne Vega's "Luka", with Evan referencing that by wearing a "Hello, my name is Luka" sticker in the clip for "Mrs Robinson". But whether it was the band's own songs or their covers, their music would come to be overshadowed by the amount of press coverage Evan received for everything from the women he was seeing (Kate Moss, Kylie Minogue, Courtney Love) to his rock star lifestyle. On the ARIA chart, "Mrs Robinson" was listed as a double A-side with "Rudderless", although the latter was only a bonus track on the cassingle and its name didn't feature on the front cover. Why was it credited at all? Brace yourselves, it's a bit complicated. 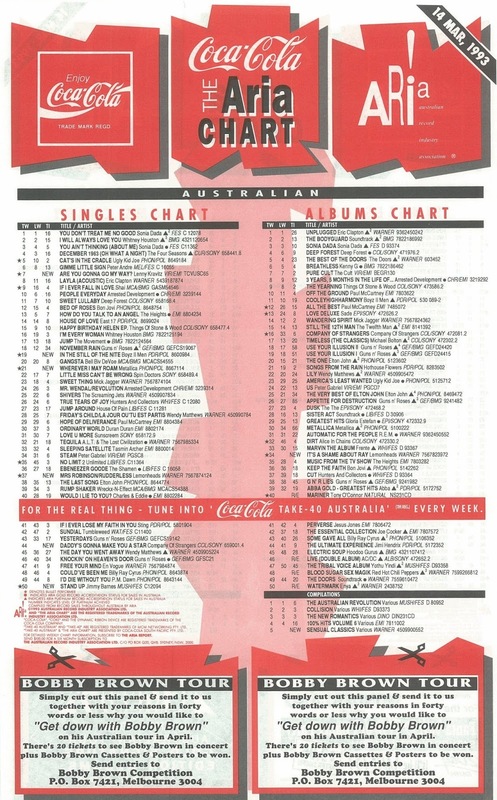 In early 1993, the cassette single was still the dominant format and the catalogue numbers you see on the chart pertain to that version of each song. Problem was, the CD single version of "Mrs Robinson" was actually a double A-side release, with "Being Around" billed on the artwork and everything. But it wouldn't do for the chart to mention "Being Around" when it wasn't available on the cassingle, now would it? And so it seems that's why "Rudderless" was elevated to double A-side status. After three straight top 10 hits from their self-titled album, Metallica had barely made the top 50 with fourth single "Sad But True". On the eve of the Australian leg of their world tour, fifth release "Wherever I May Roam" resulted in a remarkable reversal in chart fortune, almost returning them to the top 10. Other than the presence of a sitar (or similar) on the track, it was pretty much musical business as usual for the metal band who had quickly become one of the most commercially successful in the world. At the other end of the musical spectrum, but also responsible for a huge amount of record sales around this time were vocal harmony group Boyz II Men, who followed chart-topper "End Of The Road" with another soundtrack release. Recorded for TV miniseries The Jacksons: An American Dream, the quartet's version of "In The Still Of The Nite (I'll Remember)" became the second a cappella song in the ARIA top 20 as it debuted 10 places lower than Shai's "If I Ever Fall In Love". Boyz II Men's remake of the doo-wop classic was the first recording of the much-covered song, originally performed by The Five Satins in 1956, to become a hit in Australia. He had a top 10 single and album to his name already, but things really went ballistic for Lenny Kravitz in 1993 with the release of his third album, Are You Gonna Go My Way, and its all-conquering lead single of the same name. A six-week chart-topper, the funk-infused rock of "Are You Gonna Go My Way" turned Lenny from that cool dreaded guy people were kind of familiar with into a major music star. One of those songs that came together very quickly, it's apparently about Jesus - the subject of or inspiration for a number of his tunes. Despite not actually being released as a single in the US, the music video did receive a lot of play there and won the MTV VMA for Best Male Video later in 1993. Next week: another rock band scores a big hit with a cover version, plus some actual pop makes its debut, too. Hmmm, I didn't know "Are You Gonna…" was about Jesus. That would explain the halo-like light featuring in the music video! I wasn't much into "Daddy's Gonna Make You A Star" but I was reminded of it when I bought U2's Zooropa album later in the year and saw there was a song on it called "Daddy's Gonna Pay For Your Crashed Car". 'Daddy's Gonna Pay For Your Crashed Car' is a cool song title! 'Come On, Come On' is one of those flop Black Sorrows singles that could have been from any of their albums. I loved 'Daddy's Gonna Make You a Star' and thought it should have done much better on the chart. I liked the Lemonheads' version of 'Mrs. Robinson'. Never heard 'Rudderless' before, but it's nice. The female drummer, or 'the lady with the fly glasses' as she was known by us, in the 'Are You Gonna Go My Way' video was a semi-regular topic of conversation between a school friend and I... The song was catchy, but worthy of 6 weeks at #1? I don't think so.